Afterwards you may find yourself seeking flavor. ‘Perhaps if I substitute 1 cup of whole wheat flour’ or ‘Maybe some rosemary and bunch of olive oil would jazz it up.’ Those ideas are fine, but here I’m going to tell you the secret to free flavor. Ready? Sourdough. Relax, geez, I’m about to tell you. A starter is a culture of wild yeast. 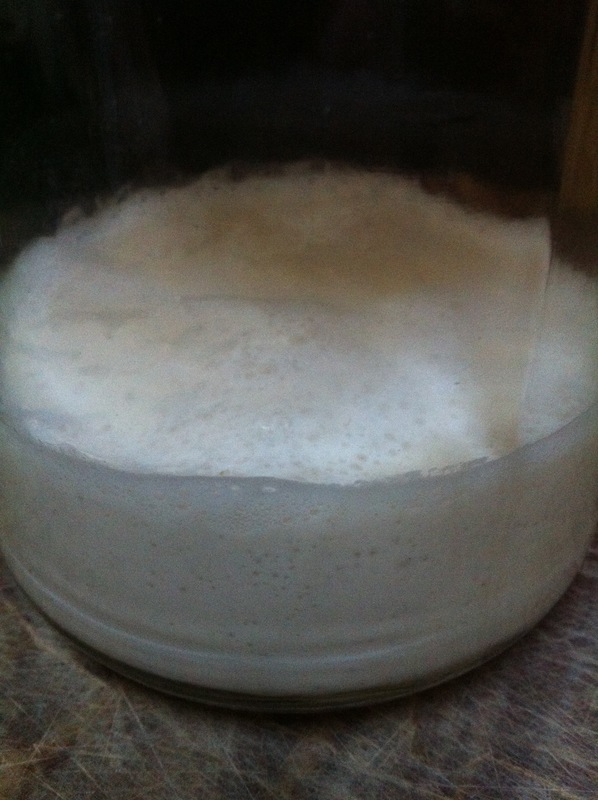 Yeast is that absolutely magnificent creature that makes life possible (or at least, worth living). In beer it turns sugar into alcohol. In bread it converts starch into a more digestible, palatable, and airy form. Yeast is man’s little deliciousness buddy, but it is doubly amazing. In the absence of food, it goes to sleep. In the absence of moisture, it forms a tough sort-of exoskeleton to seal itself in. So in fact there are dried and dormant yeast cells all around us. They float through the air, and they have an uncanny knack for depositing themselves on sugary things. That white powdery stuff on plums, apples, and grapes is yeast. It turns out they also live on grains. With bread you’d normally open a package of dried (or quick) yeast. This is a pure strain; selectively bred over millennia to provide reliable and quick leavening to bread, then grown and dehydrated in a lab. That’s fine for speed freaks and morons, but that’s not us. We want flavorful bread and we’re willing to wait (overnight if need be!) We want sourdough! Start by making sure the jar is very clean, dishwasher clean if you have to. Then poke some holes in the lid. I find the old ice pick out of my dad’s toolbox quite satisfying, but you can also use a hammer and nail. Don’t go all Basic Instinct on it though, just 3-5 good holes. Next mix the flour and water, pour into the jar, set out on the counter, and wait. After 2-3 days, add another 1/4 c each of flour and water; just stir it right in. Repeat every 2-3 days, if you start to get too much in the jar, throw away half. After a week or so you should be seeing some nice, but slow, bubble formation and a distinct sour bread aroma. That’s your starter! Just keep feeding it every 2-3 days and you can keep it going forever. Always keep it fed. Every 2-3 days if at room temp. If you need to neglect it, you can store it in the fridge, which slows activity to a crawl. Then feed it once a week (or 2 weeks at most). If you go longer it may survive, but you will have to work a bit to bring it back. (NOTE: I believe my starter is happiest when it’s always kept at room temp). Always keep it pure! 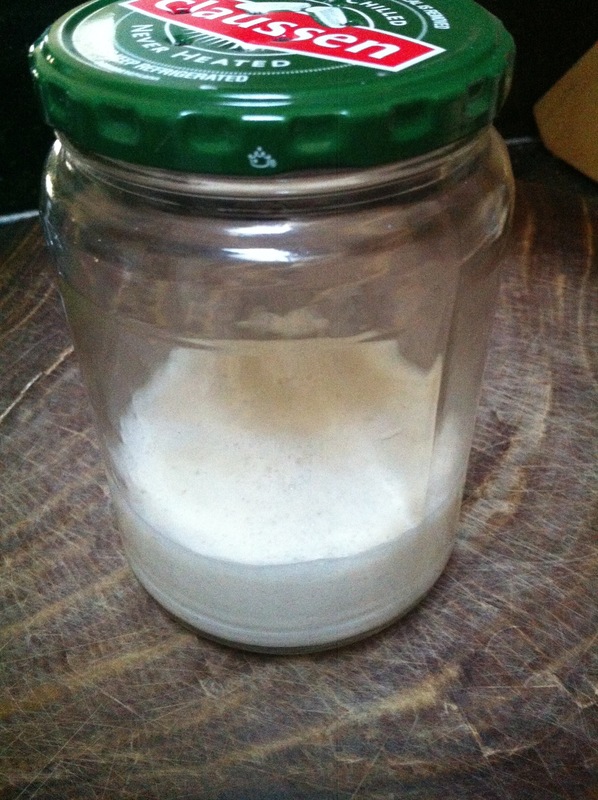 Never put salt, oil, or ESPECIALLY store-bought yeast in your starter. These will all interfere with its natural rhythm. Never heat it! Heat will kill the yeast. If it starts to accumulate some blackish liquid, don’t fret. That’s just alcohol, feel free to pour it out. Never use it all up! When you want to make bread, start by pouring it into a bowl. Add 1/2 c each of flour and water and stir well. While the starter mingles with its prey, wash out the jar, then put 1/4 to 1/2 cup of the new starter mixture back into the jar. THEN mix your bread recipe into the bowl, right on top of the remaining starter. Never feed it after midnight. No it doesn’t turn into gremlins, but it may get indigestion. I’ve never made sourdough but that’s changing now. Thanks for the lunatic’s guide to sourdough. Awesome! Let me know how it goes. This latest starter is the best I’ve made (probably the 6th time I’ve done it). Is the starter supposed to be the consistency of a paste or milkshake? Somehow I had it in my mind that it would be more runny. Matt: At 1:1 flour to water it is pretty pasty at first; but I would say more like thick pancake batter. As the yeast breaks down the starch, the mixture turns runnier. If you’re in SD I’d be happy to split you off a culture of mine; it rocks!